A descendant of the Khoikhoi (a wild African canine), Deerhound and Great Dane, the Rhodesian Ridgeback temperament reflects distinct traits and behavior of its ancestors. 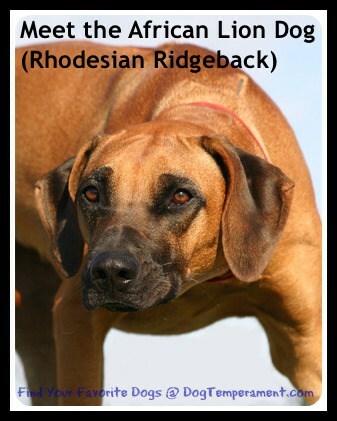 The Rhodesian Ridgeback Dog is also known as the African Lion Dog, Shumba Imbwa, Van Rooyen's Lion Dog and Simba Inja. The Ridgeback has a distint hair ridge that runs down its back, hence its name. But aside from looks what makes the Rhodesian Ridgeback stand out among the many breeds of dogs is the air of dignity that is a distinct remnant of their past as a companion of lion hunters in South Africa. The Rhodesian Ridgeback temperament demands that dog owners should put in extra time and effort in their training and upbringing. When you choose to bring home a Ridgeback, be prepared for a challenging but fulfilling undertaking. Rhodesian Ridgeback temperament can be a handful to deal with particularly when they’re still puppies. In order to have a well-mannered and disciplined dog, socialization and training must start as early as possible. Rewards-based training and positive reinforcement are very important aspects in training your Ridgeback. When training your Ridgeback, prepare to have your patience stretched thin for they can easily get into mischief when they sense that you are getting lax or they feel bored. A puppy is bursting at the seams with energy and they can be as rambunctious as they come. It is for this reason that they may not make good playmates for small children for they can get rough. The Rhodesian Ridgeback temperament with children is generally friendly, but due to the size and energy level of this breed, homes with older children are ideal. As with all dogs, the Rhodesian Ridgeback temperament with kids should be closely supervised and monitored. Never leave a dog of any breed alone with a small child. It is also important to supervise the child and make sure that he or she is gentle and respectful with the family dog. An Active Ridgeback is a Happy Ridgeback: Rhodesian Ridgeback Exercise is Crucial! A Ridgeback is most happy when you have time for regular exercise. Being highly athletic, they love tagging along when you go jogging or biking long distances. During the dog’s growing-up years, make sure he gets plenty of physical and mental stimulation. As your pet grows older, it will still need regular exercise but not as much as when they were younger. Boredom feeds the destructive tendency of the mischievous Rhodesian Ridgeback temperament. A bored Ridgeback is a fertile ground for bad behavior. Lack of mental and physical stimulation ultimately leads to boredom. To avoid anxiety and a Rhodesian Ridgeback temperament that’s gone haywire, use the known benefits of exercise to combat negative behavior. Enrolling them in agility classes and participating in contests can certainly make your pet happy and satisfied. The Rhodesian Ridgeback temperament makes them wary around new faces and even new pets. Thus early socialization is very important so your dog will get used to being around other people and other dogs. A Ridgeback’s aloof personality should never be confused with aggression. It is proper to say that the breed tends to ignore rather than bark at a stranger. The Independent Ridgebacks can be hard to train. Their pent-up energy and independent personality, coupled with their hunting dog instincts make Ridgebacks one of the harder to train dog breeds. You need to equip yourself with the knowledge and the right attitude when dealing with his breed. Be firm but not harsh and include lots of patience and your Ridgeback’s favorite treats. With proper training, the intelligent Rhodesian Ridgeback temperament can be easily managed and they can become great pets for many families. Rhodesian Ridgebacks need to look up to a dominant Alpha figure in the pack. Without a recognized pack leader, the Ridgeback will easily assume the role and that’s when there is a potential for problems to sets in. They can become combative and can become difficult to manage. A firm hand and a consistent approach to training will show your willful Ridgeback who’s in charge and who sets the rules in the pack. Training a Ridgeback can be a big challenge so they are not desirable for first-time dog owners. They will continue to stretch your patience by testing your boundaries. And when you relent even for just a moment, they jump at the opportunity to try to “seize the throne”. Rhodesian Ridgebacks do best with owners who have some prior dog training experience. If possible, find a positive reinforcement trainer in your area and sign up for an obedience class! Once you and your dog have mastered the basics, you can take your skills to the next level with canine sports such as agility, rally obedience, search and rescue, nosework and canine good citizen certification. Some Rhodesian Ridgebacks are still used for hunting and tracking to this day, however, Rhodesian Ridgeback hunting is no longer very prevalent in the United States these days. 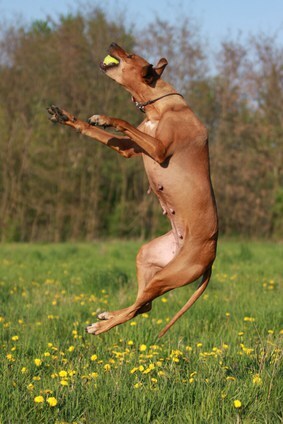 For help with training your Rhodesian Ridgeback Dog look at The Online Dog Trainer by Doggy Dan. Doggy Dan is an expert Dog Trainer based in New Zealand. His online resource contains Hundreds of Excellent Dog Training Videos that will take you step-by-step through the process of developing a healthy, happy well-behaved dog. Is the Rhodesian Ridgeback a guard dog? It depends on the dog, but most Rhodesian Ridgebacks will naturally bark to alert their family when a stranger enters their territory. The Rhodesian Ridgeback bark can be pretty intimidating, so yes, the loyal Rhodesian Ridgeback temperament makes this breed a good watchdog. However, overly protective behavior is a cause for concern. 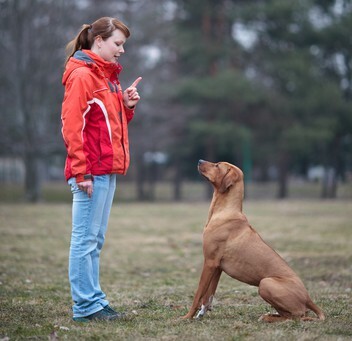 If you are struggling with excessive guarding behavior, seek advice from a professional dog trainer. Rhodesian Ridgebacks are part of the hound group, so they resemble very large, muscular hounds. Their most distinctive feature is a “ridge” of hair that runs along their back. The average Rhodesian Ridgeback weight is 70 lbs (female) and 85 lbs (male). Average height is between 24 and 27 inches. There are very few accepted Rhodesian Ridgeback colors. In fact the Rhodesian Ridgeback comes in only one recognized color: Wheaten. Blue Rhodesian Ridgebacks are not a recognized color in this breed. If you think you spotted a blue Rhodesian Ridgeback, it might actually be a Thai Ridgeback. Look up Rhodesian Ridgeback vs. Thai Ridgeback to see the differences between these two breeds. Rhodesian Ridgebacks generally have black noses, but there is a rare variety with brown noses. The Rhodesian Ridgeback coat is short and easy to maintain. It does not require professional grooming. Occasional baths and brushing at home will suffice. Rhodesian Ridgebacks shed moderately throughout the year and their fur is not considered to be hypoallergenic. Rhodesian Ridgeback eyes should be checked and cleaned periodically. Their teeth should be cleaned on a regular basis, and their nails should be kept nicely trimmed. Like all dogs, your Rhodesian Ridgeback should visit the veterinarian at least once per year for a checkup and vaccinations. This will help your veterinarian spot early warning signs of concerning diseases. Your Rhodesian Ridgeback should also be up to date on heartworm preventative and flea/tick preventative at all times. Spaying and neutering is highly encouraged for both health and behavioral reasons. It is also an important step in reducing the animal overpopulation problem in this country. Ethical breeders will include a spay/neuter clause in their contract. With excellent care, the Rhodesian Ridgeback lifespan is between 10 and 12 years. A few individuals have made it to the age of 16! Note: if you agree that your health and your dog's health should be a top priority then get a copy of The Ultimate Guide to Dog Health. Your Rhodesian Ridgeback friend will love you for it. This guide will help save you money, time and most of all help you keep your dog healthy. One behavior problem that crops up from time to time is Rhodesian Ridgeback barking. Rhodesian Ridgebacks are part of the hound group, and hounds, in general, tend to be a vocal set. There are some things that you can do to work with this issue if it arises. For example, reward quiet behavior at home and give timeouts for barking. Give your Rhodesian Ridgeback plenty of exercise, playtime and mental enrichment to prevent barking or howling from boredom. However, at the end of the day, if you cannot tolerate any barking, a hound breed is probably not the right choice for you. Rhodesian Ridgebacks (and other hounds) are also prone to a behavior issue called resource guarding. Many hound breeds live and work in packs, so they have to protect their food and resources from other dogs. Some Rhodesian Ridgebacks extend this natural dog behavior to protecting food or other items from the humans in the household. Do not punish your dog for this, because it is a natural instinct. Instead, teach him that good things happen when a human approaches the food bowl. While your dog is eating his normal dog chow, walk by and toss a small piece of chicken or roast beef into his bowl. Over time, your dog will form a positive association with humans approaching his food bowl and he will get excited rather than upset when you approach. If you have any concerns about Rhodesian Ridgeback temperament problems, always consult with a professional positive reinforcement trainer. Once you make the exciting decision to add a Rhodesian Ridgeback to your family, there are many great options for finding your perfect dog. There are already a lot of homeless dogs in the US so please look into Rhodesian Ridgeback rescue groups and adoption centers before buying a Rhodesian Ridgeback puppy from a breeder. The national Rhodesian Ridgeback club has a link on their website to four different rescue groups that specialize exclusively in rescuing and rehoming Rhodesian Ridgebacks. You can also find more adoptable Rhodesian Ridgeback through facebook, Petfinder.com, Adoptapet.com, Getyourpet.com, and Google. Do not forget to stop by your local animal shelter and let the staff know that you are searching for a Rhodesian Ridgeback for adoption or a Rhodesian Ridgeback mix. Leave an application on file with the adoption counselors. Many of the Rhodesian Ridgebacks in rescue are adults, but this is not necessarily a bad thing. Puppies require a ton of time, energy, supervision, and training. Adopting an adult is a great way to enjoy the qualities of the breed without going through the exhausting puppy stages of housebreaking, chewing, and play biting! Many adult dogs in rescue groups already have some prior training. When you adopt through a rescue group or adoption society, the Rhodesian Ridgeback cost will probably be between $75 and $200 depending on the rescue group and how much prior vetting the dogs receive. At the minimum, most adopted Rhodesian Ridgebacks will be spayed/neutered and vaccinated prior to adoption. Some adoption packages may include microchipping and other perks. 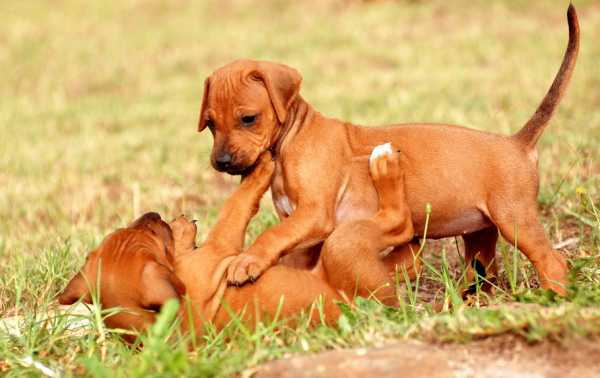 If you decide to work with a breeder, make sure you do your research to make sure you locate Rhodesian Ridgeback puppies from an ethical source and not from a puppy mill or backyard breeder. A good place to start your search is the Rhodesian Ridgeback Club of the United States. The club maintains a list of breeders who have agreed to abide by the club’s code of ethics. However, you are still responsible for doing your own research and visiting potential Rhodesian Ridgeback breeders in person. Never purchase a Rhodesian Ridgeback for sale over the internet or from a pet store. Always visit the breeder in person to see what kind of conditions the puppies and the breeding dogs are living in. When you visit the breeder, ask to meet the parents of the litter and make sure they have sound temperaments. Ask to view medical records and the results of genetic testing. The breeder will likely have a list of questions for you as well. A responsible breeder wants to make sure that every puppy goes to an excellent home. If you purchase a puppy from a reputable breeder, the Rhodesian Ridgeback price will be between $700 and $2,000. This athletic dog breed has been able to face the king of the jungle with agility and courage, so be prepared to deal with this breed’s imposing presence. The Rhodesian Ridgeback temperament will certainly be a challenge that many owners must willingly undertake in order to have a well-discipline and happy pet.